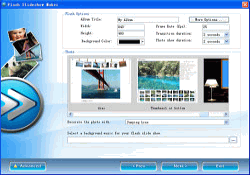 Flash Slideshow Maker is a Flash album creator to make animated photo slide show with SWF file as the output format. It transforms your digital photo collection to Macromedia Flash file format ( SWF ) which you can share your memorial moments with your family or friends on your own homepage, post on your Blog or upload to your own website. Flash Slideshow Maker is the ideal tool for create slide show widget for your website quickly and easily.